As an online marketer, one of your best indicators of success is how well you manage to convert your readers. If you find you’re not meeting this goal, you may want to take a look at the methods you are using, such as your Call To Action (CTA). If your this isn’t optimized, or is overly aggressive, you may be driving your prospects away rather than converting them. Using a popup strategy that drives conversions without annoying your readers is surprisingly simple to do, with the use of triggers and cookies to control them. Fortunately, Popup Maker enables you to do this in a way that works with your content. In this post, we’ll explain what popup triggers are, then discuss how to trigger and control your popups using cookies. Throughout, we’ll provide some use cases and give you step-by-step instructions for setting them up using Popup Maker. Let’s dive in! 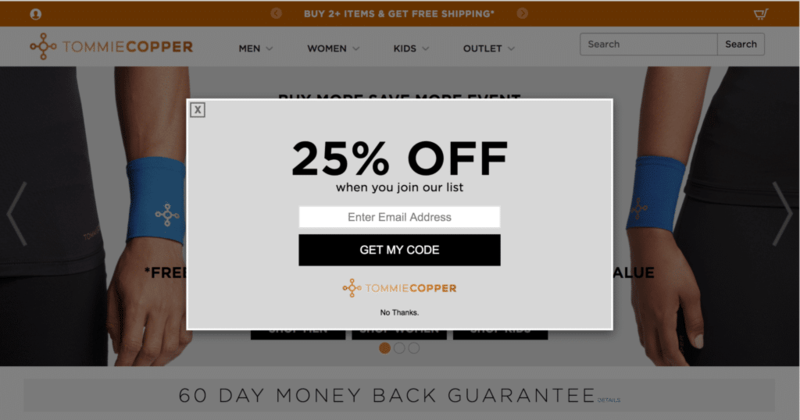 TommieCopper uses time delay/auto open popups to promote discounts. In short, a popup trigger controls when your popup CTA will appear, and can be set in relation to the actions a customer takes on your site. For example, if an end user scrolls, clicks a specific link, or attempts to exit your site, you can show a popup asking them to take further action. From this, you can begin to see the benefits of using triggers in conjunction with your popups. Rather than simply have them display to all visitors regardless of their actions, you can use triggers to provide flow, and a ‘path’ throughout your website. Of course, the finishing line will often result in a sale or other conversion. Let’s take a look at some specific examples of how triggers relate to popups. ‘Time Delay’ (or ‘Auto Open’ triggers). This enables you to set a specific timeframe for opening a popup. Usually, you’ll give the reader a few seconds to view the page before activating the trigger. These triggers are ideal for promoting opt-ins, special offers, or sales. However, they can have many other uses, including maintenance alerts, news updates, or login/logout notifications. ‘Click Open’ triggers. These detect when a user clicks on a site element, such as a link, button, or image, and are useful when you want to present a popup without the intrusion a time-delayed trigger provides. Exit intent triggers. Your popups can essentially ‘lay in wait’ until a customer attempts to leave your site, by monitoring the user’s mouse to detect movement towards the browser toolbar. This plays on the Fear Of Missing Out (FOMO) concept. Exit intent popups are great for reducing high bounce rates, as they remind users of the value your site offers. Scroll triggers. Much like exit intent triggers, these detect when a user scrolls through your site and gets to a predetermined point. They’re ideal for presenting a CTA at the bottom of a page, or if a user scrolls near or beyond a certain element on your site. Of course, you don’t want a popup to appear every time a customer scrolls through your site, but you do want to alert them to a special offer. It’s this last trigger that brings up an interesting point. If you’re constantly bombarding the user with popups, they’ll quickly become fatigued, frustrated, and potentially an ex-visitor of your site. Let’s discuss how you can prevent that, yet still maximize conversions. Netflix is a great example of a site using cookies to enhance the user’s experience. For the uninitiated, cookies tell your web browser when you’ve accessed a site before. They store information on your computer or device that your browser can use later when you use the site again. In other words, if you access and interact with a site, a cookie will have information about your last visit, meaning you can receive tailored experiences based on your past browsing history. 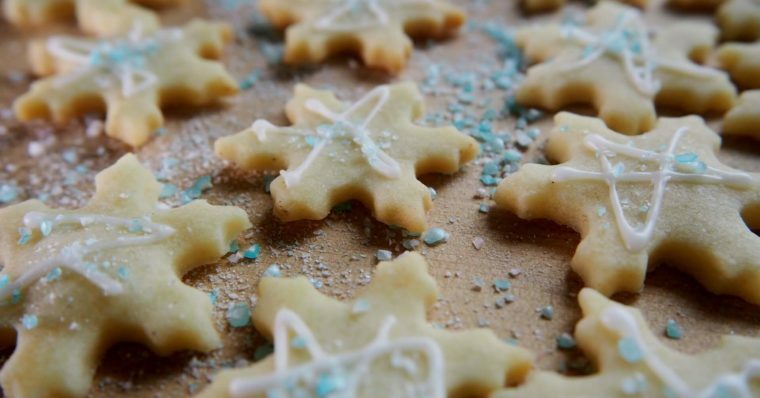 In relation to popups, cookies can help negate their poor User Experience (UX) aspects, which was in part responsible for Google’s recent policy amendment on using popups. Many users have found popups to be intrusive, but when set up correctly (i.e. triggered appropriately and using cookies that take into account the user’s browsing history), they’re no more annoying than any other site element. Take, for example, a popup asking a user to sign up to a newsletter. Regardless of how well-designed it is, the user will likely become frustrated if they still see it every time they visit your site – especially if they’ve previously interacted with it. Setting a suitable cookie here will stop the popup from displaying based on a users’ previous interaction. As you can gather, popups can be easily controlled through the use of triggers and cookies. While both are powerful ways to manipulate popups individually, by using them together you can create a site that offers high conversion rates without impacting UX. In fact, when implemented correctly, your users may not react to your popups the way they’ve been traditionally received. However, by default, triggers and cookies aren’t set up to work with each other in Popup Maker, so you’ll need to do some work upfront to get things set. For our example, we’re in the middle of setting up a limited time offer popup. Once you’ve purchased, installed, and activated the plugin, you’ll want to set up a suitable trigger. In the General tab, select how much time it should take for the popup to appear by dragging the Delay bar. Once you click Add here, your popup will display after the resultant number of milliseconds. Of course, the main setting here will be Cookie Time. By default it’s set to 1 month, and we think this is a good general rule of thumb to adhere to. 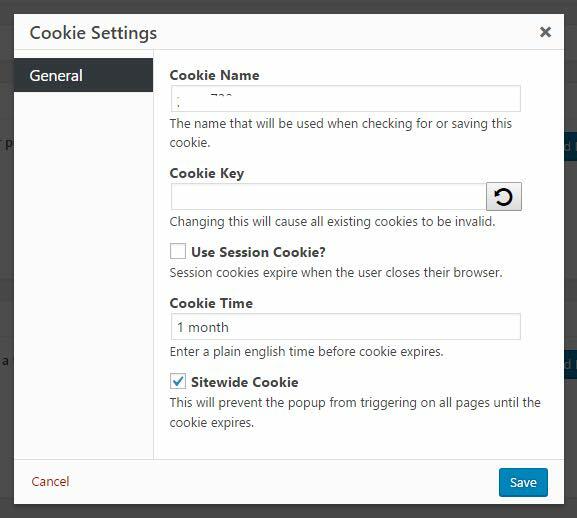 As for the other settings here, depending on your goals, you may want to check Use Session Cookie , which clears cookies when the browser is closed. This may be suitable for enabling visitors to see a popup if they leave your site and return at a later date – think of a time-limited offer, for example. Finally, to avoid the popup triggering on every page of your site, you’ll want to check the Sitewide Cookie box. Once you’ve finished, remember to save your changes, and continue creating your popup as normal. While it’s important to have an overall strategy for your popups, understanding the best ways to use and control them can help you improve your conversion metrics and the relationships with your customers. Popup Maker’s use of triggers and cookies is an elegant solution to integrating popups as part of your overall plan for boosting your leads, sales, and conversions. In this piece, we’ve discussed what triggers and cookies are, and how they can be used to control your popups with Popup Maker. We’ve also shown you how to achieve this, along with some use case scenarios and advice for implementing them optimally. Do you have any questions about how to control popups through cookies and triggers? Let’s discuss them in the comments section below!